he was quite hard to beat. Yes, Pig was a cheat. Pig the Pug is back in his third laugh out loud adventure and, as always, Trevor the Dachshund is right by his side. This time, Pug is doing whatever it takes to win, and making a contest or race from everything he and Trevor do. But, when he insists on an eating race, he eats more than he intended, ending up with the bowl wedged in his mouth. Using jaunty, well-written rhyming text Pig the Winner tells a tale that is chiefly humorous but also has a gentle message about competitiveness and friendship. Blabey’s illustrations , in acrylic as well as pen and pencil, are filled with funny details, and the facial expressions of both characters are hilarious. 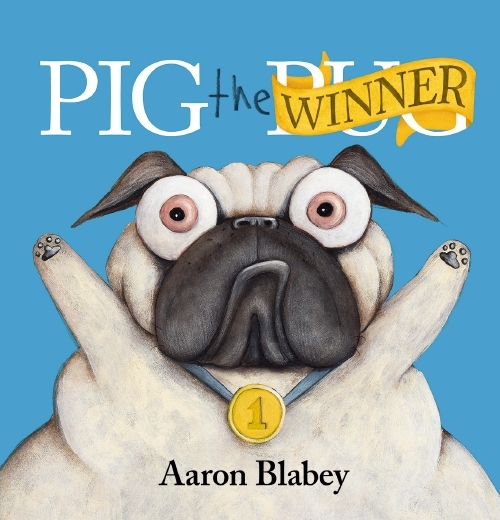 Perfect for read-aloud sharing, Pig the Winner is a winner.